To the front of the house there is a small lawned area, containing rose trees and some fresh herbs, including mint for your Pimms. 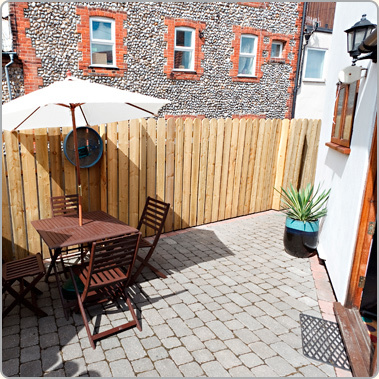 At the rear of the property is a block-paved, fenced and fully self contained courtyard. 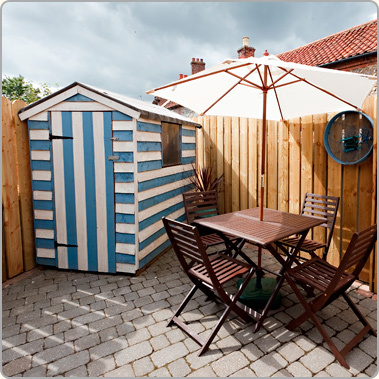 With an outdoor table and chairs, charcoal BBQ and a ‘beach-hut’ themed shed, we have tried to include everything that you might need to enjoy the outdoors elements of your stay – deckchairs, a windcheater, buckets and spades, kites and a badminton set!